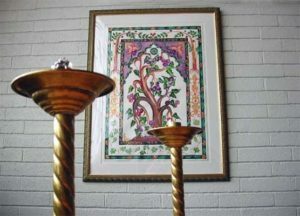 Please join us for lay-led Shabbat services this Friday and mark your calendars for the many events in the weeks ahead! Oneg Host: Seeking volunteers; otherwise, it will be potluck oneg. No school – Thanksgiving weekend. Friday, December 1, 7:00 p.m.
Our featured speaker will be Cheryl Hamilton, an expert on refugee resettlement and immigrant integration. Hamilton currently serves as Lowell site director and director of partner engagement at the International Institute of New England (IINE), a non-governmental, not-for-profit organization dedicated to addressing the needs and rights of refugees and immigrants. Hamilton will explore why immigrants come to the United States, how they gain entry, and what happens after they arrive. She will also discuss services provided by IINE and what kind of actions we as individuals can take. She will be joined by a recent immigrant who will share their story as well. Just one more week to RSVP! Join your TEMV friends at the Mandarin Asian Bistro for a TEMV FUNdraiser! Eat a delicious dinner with friends while helping to raise money for our temple! The restaurant will donate 15% of our bill that evening to TEMV. They serve Chinese food as well as sushi, and are located at 24 Market Street in Lowell. Monday, December 4, 7:00 p.m. Please join us for “A Conversation with Leslie Sachs, executive director of Women of the Wall.” Since 1988, Women of the Wall has fought for women’s right to pray collectively and aloud with Torah Scrolls, Tallitot and Tefillin at the Western Wall, Judaism’s most holy site. Through education, social advocacy and empowerment, Women of the Wall strives to change the status quo and works to expand civil rights, human rights and religious freedom in Israel.